Aztec moon goddess, Moon goddess, Aztec goddess, Coyolxauhqui, Aztec Art, Aztec, precolumbian reproductions, mesoamerican reproductions. Temple Mayor Museum, Mexico City. 1400 A.D. 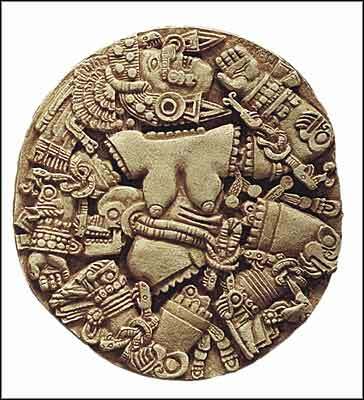 This sculpture, 10 feet in diameter, is one of the most impresive and important examples of Aztec art. Her name is Coyolxauhqui, which means "She of the Rattles on her Cheeks". She was also called one who "spoke to all the centipedes and spiders and transformed herself into a sorceress" or a "very evil woman". She was one of the major goddesses in Aztec mythology. In a mythical representation of the triumph of the sun over the powers of night personified by Coyolxauhqui as a lunar goddess, she is shown decapitated and dismembered after she was slain by her brother, the Sun God, Huitzilopochtli. Here, bells decorate her cheek, and in accordance with her ferocious image, she wears a skull on her belt and serpent armbands with claws attached.